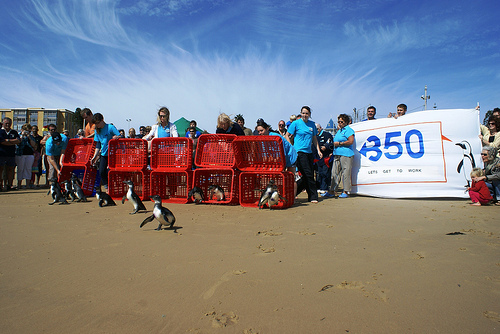 Participants help release rehabilitated African Penguins affected by oil pollution to promote environmental conservation as a solution to climate change and to urge politicians to pass clean energy policies. This was one of over 7,000 climate action events taking place in in 188 countries around the world on 10/10/10 as part of “The Global Work Party.” This synchronized international event is organized by 350.org, and is expected to be the largest day of environmental activism in history. Copyright info: This photo is freely available for editorial use and may be reproduced under an Creative Commons Attribution-Non-Commercial-Share Alike 3.0 license.